A walk up the valley of Middle Hope from Westgate followed by a crossing over Windy Hill in to Rook Hope before returning via the Weardale Way. When, at the end of the previous June, I’d stepped across the watershed fence to touch the Raven Seat trig point on Harnisha Hill it was the first time I’d set foot in the catchement area of the Wear since May 2013. Therefore this walk was a welcome and long overdue return to Weardale. The main aims of this particular walk were to explore some of Middle Hope, a side valley of Weardale, visit the trig point on Windy Hill and finally take a look at West Rigg Opencut, a disused quarry where a large vein of quartz is exposed in the surrounding limestone. Joining me on the walk was Paul who originally hailed from nearby Consett and who has family ties to Weardale. Although he had previously done some walking around Westgate it was the first time either of us had been up Middle Hope and what a fantastic place it is! Almost immediately upon leaving Westgate we came across a quite delightful double waterfall which would have been even more impressive after a wet spell. 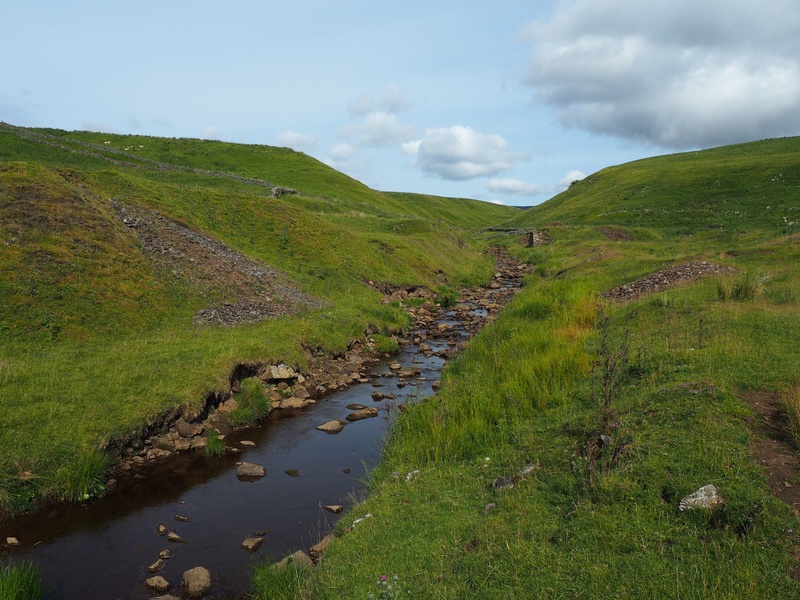 Continuing north alongside Middlehope Burn the sides of the valley became steeper with cliffs forming on the opposite bank of the beck and then a substantial scar appearing on the eastern side as we arrived at the site of the former Low Slitt Lead Mine. Amongst the ruined mine buildings were some well preserved bouseteems built up against a limestone cliff – bouseteems being term for a storage area for ore that had been mined nearby. Leaving the mine behind the path stayed close to the beck amongst the trees for a short while longer before opening out at the ruins of some more mine buildings. The view now encompassed some of the moors forming the flanks of the upper reaches of Middle Hope. As we finally climbed away from the burn to reach a track the views over Middle Hope became more extensive. Following the track a short way north we then slanted across several pastures toward the road junction at Scarsike Head. At Scarsike Head we noticed an old guidepost to Wolf Cleugh, a farm in the valley of Rook Hope. Rook Hope itself had also now come into view with my first sighting of this valley since I’d been on Dry Rigg and Bolts Law back in 2009. Taking the second of two gates on the right (with a sign warning of cattle but which bizarrely had a picture of a lapwing) we then followed a quad track across the top of Windy Hill to reach the trig point that is named as Lintzgarth Common on the Ordnance Survey trig database. The trig point was located in a sharp corner formed by the meeting of a wall and a fence which has a completely different angle to that shown on the map. The view from the trig point was quite extensive with the weather station on Great Dun Fell appearing over the fells of the Tees / Wear watershed. However, our attention was taken by something close to hand, a hut on stilts just across the fence from the trig point. The hut was not on fowl’s legs so we knew it could not be the Russian witch Baba Yaga taking a holiday in Weardale. Upon closer inspection we decided it must be a hide but it was still quite bizarre sitting all the way up there on the moor. The next stage of the walk saw us work our way down to the section of the Weardale Way between the village of Rookhope and Smailsburn Farm. The route was via the type of right of way which only exists on a map and not on the ground. Navigation was made more difficult by the presence of a few fences not on the map and none of which had stiles allowing easy passage for the supposed right of way. On the plus side we did have some fine views of the valley of Rook Hope. Once down at Smailsburn the walking underfoot got a bit easier though even at this stage we remarked that judging by the state of the path the Weardale Way could hardly be popular. Briefly we enjoyed a fine stretch passing the ruined house at High Bishopseat. From High Bishopseat the path carried on along what appeared to be a man made embankment, possibly for an old railway. At Crow’s Cleugh this section ended all too soon as we took the ‘path’ heading across the pastures of Cuthbert’s Heights. Again the path existed more as a concept than in reality and we were left wondering why on earth the Weardale Way had been re-routed to follow this route. The stiles and signs we did come across left much to be desired. All in all it was a bit scrappy. We eventually came to a large pasture with a plantation slap bang in the middle where the right of way used to pass. The footpath sign pointed us to the southern end of the plantation but as some rather flighty cows had just run to that corner of the plantation we decided, at my request, to walk round to the north. All seemed fine until we were walking across the open pasture on the other of the plantation when the cows we’d seen earlier began to run towards us. Having been stuck in a field surrounded by cows who had run at me only a few days before I wasn’t in the mood for a repeat performance and began to nervously measure the difference in distance between me and the gate and the cows and me. Fortunately they came to a stop about ten metres from us and we were able to exit the field unmolested. After a couple more fields we took a grassy track past the ruins of White Hall and the remains of a quarry to reach the road just below West Rigg Opencut. This was a place I had been looking forward to visiting for some time. Unfortunately access was blocked due to the presence of a clay pigeon shoot. Quite how people are allowed to go shooting in a designated Site of Special Scientific Interest baffled me. In the end I had to make do with cautiously thrusting my camera through the fence alongside the road to take a picture while being aware of the fact that the people down in the quarry were shooting back up towards the road! Across the road from the entrance to Westrigg was a permissive track leading down through some more old mine workings. Rather than following the road back in to Westgate as originally planned we belatedly sat down to have something to eat before following the track which led us back to Low Slitt Mine. Back at the mine ruins we then retraced our earlier steps back along Middlehope Burn. This walk was a bit of a mix really. Middlehope Burn was superb and there were some fine views of Weardale and the valleys of Middle Hope and Rookhope. In contrast to this there were some of the paths ranging from scrappy to non-existant. This in itself was not a problem, I’m usually more than happy to take a pathless route. What irked me was that as a public right of way there should have been better access over walls and barbed wire fences. The biggest disappointment though was being unable to have a look around Westrigg Open Cut.